Deventer (pop. 97,000) is a picturesque city in the Salland, the region where the Salian Franks originated around the 2nd century CE. Deventer op stelten ("Deventer on Stilts"), a spectacular open air festival held in early July. Europe's largest book fair (about 125,000 visitors) in early August. the Charles Dickens Festival in December, which attracted 160,000 visitors in 2007. Deventer was probably founded around 768 by the English missionary Lebuinus, who built a wooden church on the right bank of River IJssel. The village was burnt by the Vikings in 882, and immediately rebuilt and fortified with an earthen wall. 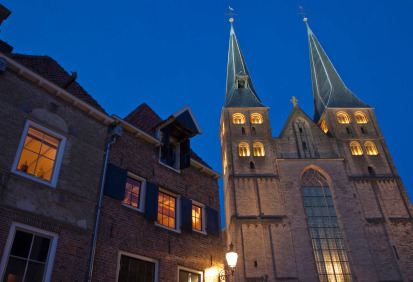 Deventer is officially the first place in the Low Countries to have been granted city rights during the medieval period - in 956. Its fortifications were consequently replaced by stone walls. As a harbour of the IJssel River, reachable by sea, Deventer flourished thanks to trade, became a member of the Hanseatic League in the 15th century. The city had a common mint, where coins for the 3 IJssel cities of Deventer, Zwolle and Kampen were made. 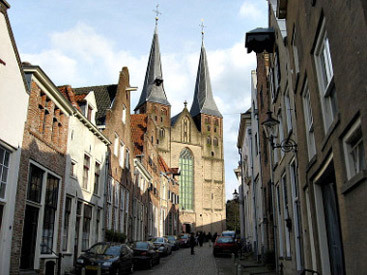 Deventer was one of the first cities to be equipped with printing press (from 1477). It had an internationally famous Latin School, which the famous humanist and theologian Desiderius Erasmus (1566-1636) attended as a boy. The progressive silting up of the IJssel cause sea trade to decrease considerably from the 16th century. The iron industry revitalised a bit the local economy in the 18th century. 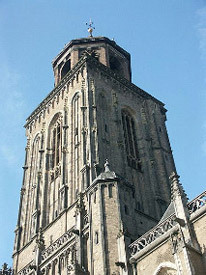 From the middle of the 19th century, Deventer became an industrial town. Bicycles, carpets, tins and cans for foods and drinks, cigars, books, machinery, mattresses were produced until 1970. 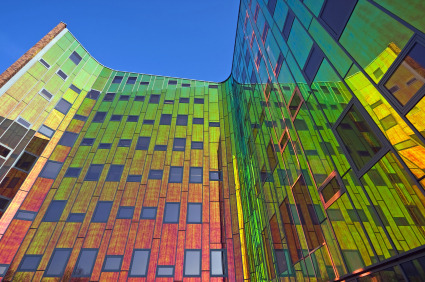 Nowadays, the main industry is central heating systems. Deventer honey cakes are sold all over the Netherlands. There isn't any major museum here, and few tourists find their way to Deventer. It is a shame as Deventer is a particularly charming city. The best way to tackle the city is to stroll around its well-preserved streets to catch the atmosphere. Among buildings of interest, let's note the Waag (weighing house, built in 1528, now housing a small toy museum), the houses on the Brink (market square), the late Gothic-style Lebuïnuskerk (St. Lebuin's Church), the Gothic-Romanesque Sint-Nicolaas of Bergkerk (Church of St Nicholas-on-the-hilltop) and the 14-th century Broederenkerk (Brothers' Church). 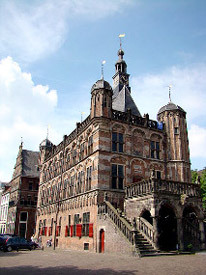 Deventer is on the E30, going west to Utrecht and The Hague, and east to Enschede, Osnabrück and Hannover. The A50, between Eindhoven and Zwolle, runs 8 km west of the city. The E30 splits before Amersfoort towards Amsterdam to become the E231. The Dutch road sign system refers to this motorway as A1 (Amsterdam-Deventer). Deventer's railway station is located on the important line Amsterdam/Utrecht-Amersfoort--Osnabrück-Berlin/Hamburg, crossing the line Zwolle-Arnhem-Nijmegen at Deventer. There are direct trains from Zwolle (25min), Arnhem (35min), Nijmegen (50min), Utrecht (55min), Amsterdam (1h20min), and The Hague (1h40min), among others.